In July we found ourselves with a rooster who would not work for our flock. He was a bit of a jerk, perhaps due to our own measures of jerkiness, but still. He was also very small, and could not be the genetic future of our flock. 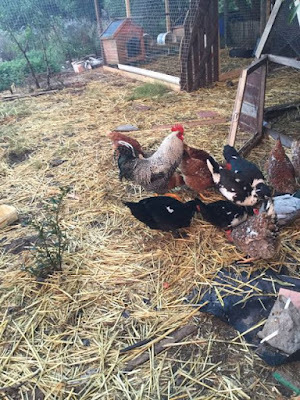 Someone had a very large rooster (Boschvolder X Potchefstroom koekoek) that they were getting rid of, but first we had to say goodbye to Bruce... the whole process took a while (killing-scalding-plucking-eviscerating), and I cannot imagine us doing it more than once in a while. Eating him was a new experience for me. This month I had to kill a rat, and an injured mole rat. I didn't feel like we had much choice in either case. The rat was not going to join my favourite NGO, and sending rats over to neighbours seems like a bad idea. 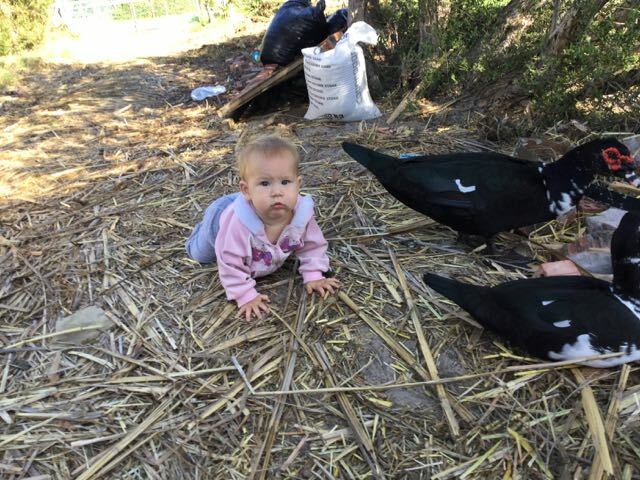 I did feed it to the chickens, at least. So anyway, it was a big month in the world of taking animal lives. Not enjoyable, but somehow this-- eating stuff, killing stuff-- is the way the world works in some deep way, and it'll make total sense one day in heaven. Bruce is the rooster on the right corner. RIP. This the paint-bucket kill cone for Bruce. He was not super tasty, but it was a good learning experience, and look at Henry II, who replaced him! 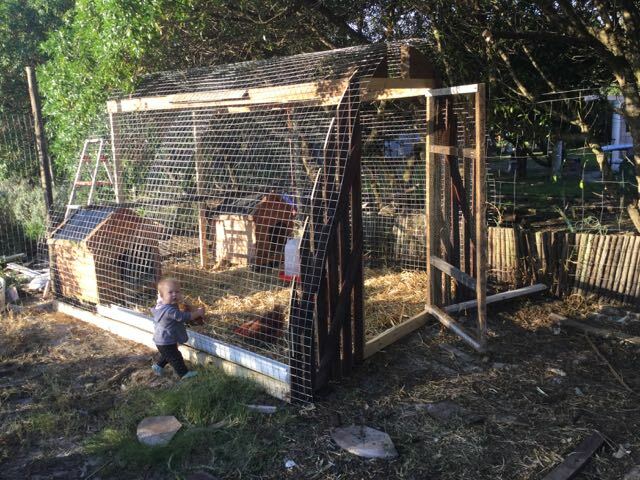 Eug made this bigger chicken coop to allow for more chickens. We're still having some problems finding their eggs, but hopefully we'll figure it out. 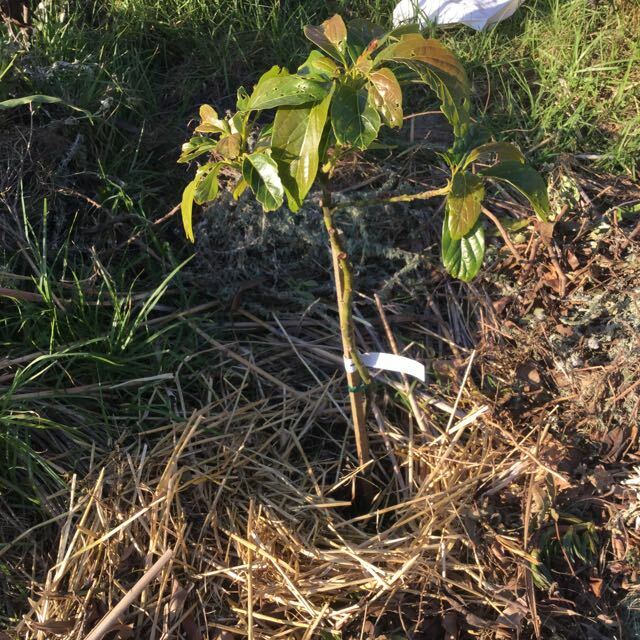 One of three avocados. We have three different varieties (Hass, Ryan, and Fuerte). Elderberry grown from cutting. It was in a really grassy patch, so I transplanted it and put it closer to the house, where the grass is not so bad. Ducks loved the reservoir until it got fenced in. We should probably let them in now and again, but for now they just have a little kiddie pool. Macadamia tree -- can you the shoots popping up at the top of the picture. 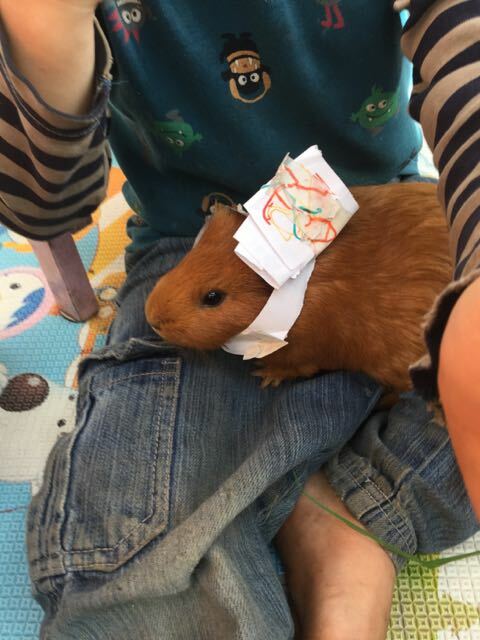 dressing up the guinea pig. She doesn't seem to mind. You should see them trying to dress Hana. 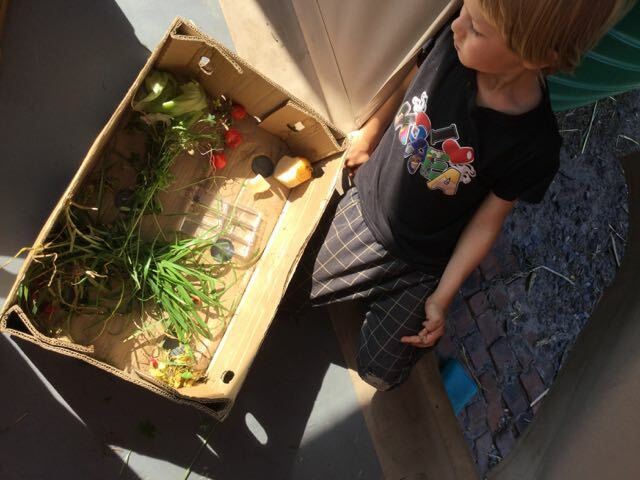 Now and then Noah makes a ducks and chickens restaurant, and goes around feeding them scraps. 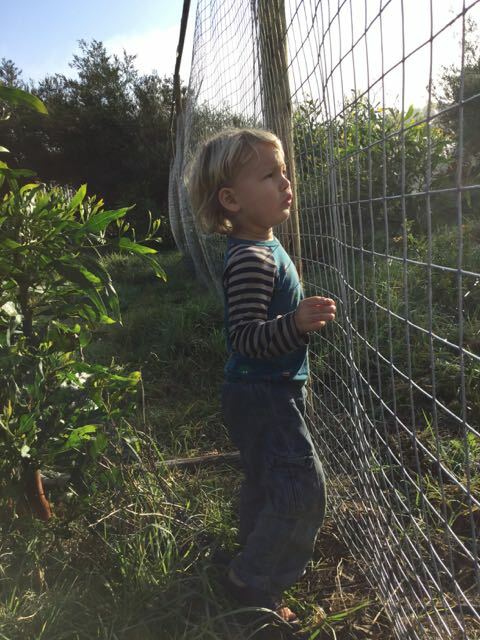 The fence for the annual garden is up. Exciting times. It was unseasonably warm for a few days in July, so Noah and Eli could actually body surf and swim a bit! I didn't have their bathing suits (it's mid-winter!) but they didn't care. 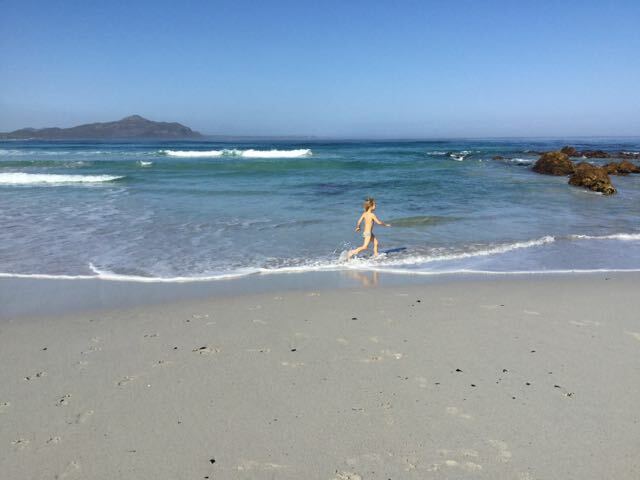 This is Soetwater, our second-closest beach (closest beach is Kommetjie, but it is a bit busier with dogs and stuff, so we come here for the rock pools, even if it's too cold to touch the water). 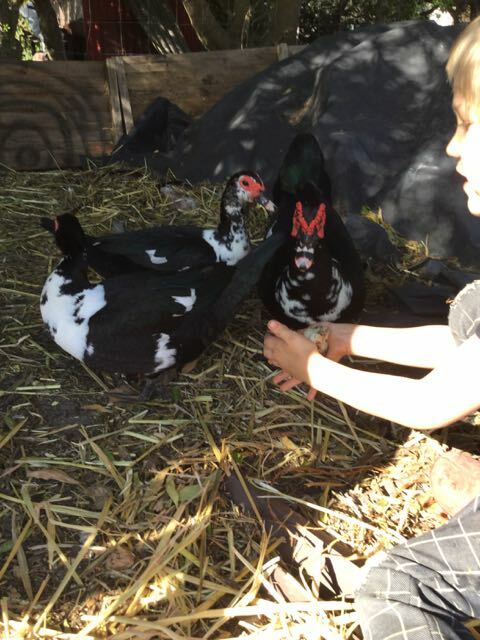 Hana, with Male the Muscovy for scale (or vice versa). Hana insists on being let down to crawl around. Thankfully our devil thorns are already a lot less prevalent than they were last year. Lots of mulch seems to have helped. Here's Henry II, our new rooster. Isn't he handsome? Five of our hens are Boschvelders, and 3 are Lohmann Browns. We're hoping they'll have productive egg-laying babies. Boschvelders and Koekoeks are both good mixed-breed birds, whereas Lohmann Browns are egg-layers. They have great big eggs. While we're mainly interested in having a self-sufficient laying flock, we do also want to be able to eat our roosters. Though not Henry. He would eat us first. fowl meet and greet. Trying to introduce Henry (after his 1 week quarantine) gently, over some yummy grain. Hana chilling out after climbing terrifyingly. 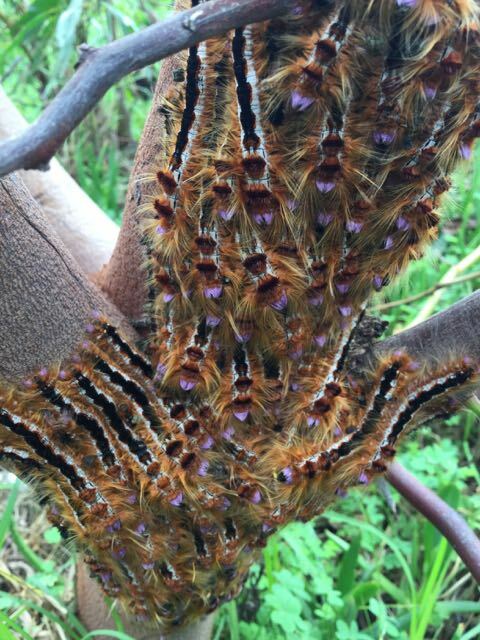 June updates: Tilapia experiments, fencing, rain and five free chickens. The rain came this June. We'd been waiting and waiting, as it was almost two months later than usual. No photos this month because, in an embarrassing tragedy, we cooked our camera in the woodstove. In other news, our woodstove is great. 2 pieces of wood is enough to heat our house for the night. 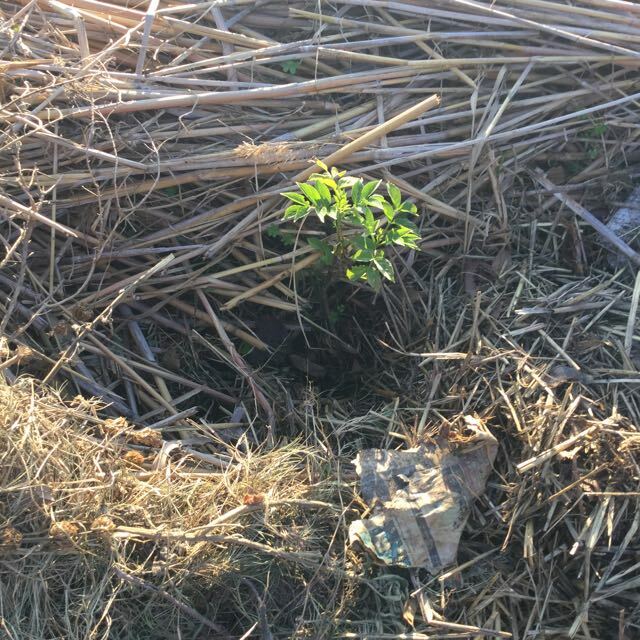 On to the farming updates: This month we started to receive regular deliveries of landscaping waste from two different landscaping services (thank you Samantha)!! Following the work of Akira Miyawaki and David the Good and others, I'm really into this idea that you can grow a forest really fast by layering a 30-60cm of biomass over the surface of the soil (in our case, beach sand). To an extent this is an experimental leap, but the arguments I've heard for this approach are pretty convincing, and already the soil around many of our trees shows remarkable change. There's another reason I'm excited about landscaping waste: I have a couple of repeat conversations going with Eug, one of which goes along the lines of: Could we maybe get some goats? I mean I'm just kidding. Ha! Obviously not. If I ask for goats again, remind me we still need to build my parents a house. And then a week later, I start on about dairy goats again. We're NOT getting goats right now, but I'm hoping that getting waste from landscaping companies will eventually lead to good, consistent, forage for dairy goats. Buying or growing food for goats immediately puts them in the realm of financially impractical for our farm. 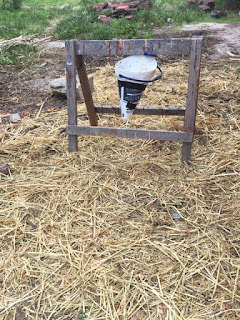 Even though this farm is not only about saving us money, we do want to experiment with doable, helpful stuff, and, to the extent we can, avoid ridiculous stuff (see alpacas), though obviously the line between the two is woefully fuzzy. If you're buying in all your goat feed and you're living on a relatively expensive piece of land near the city, it may be better to just buy your milk and cheese. 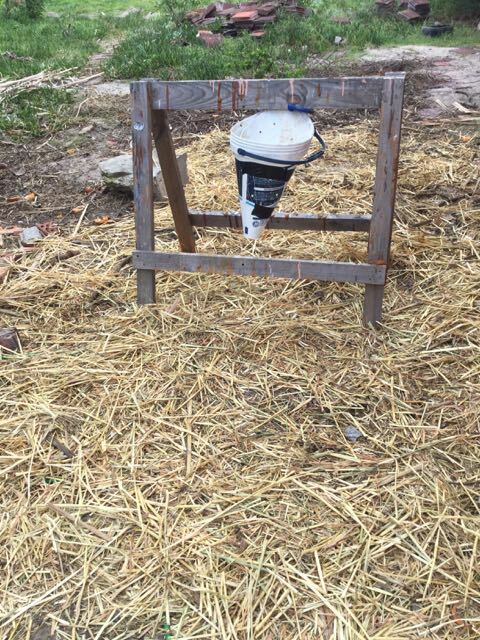 With substantial free forage, though, the costs change and it becomes much more practical. Either way, if I start talking about dairy goats in the next two years, remind me: Not Yet. And don't tell my parents that they'll be babysitting goats when they move onto the farm. We started to build fencing for our annual garden, plus some space for a small nursery for baby shrubs/trees/plants to get bigger and stronger before they get planted out. 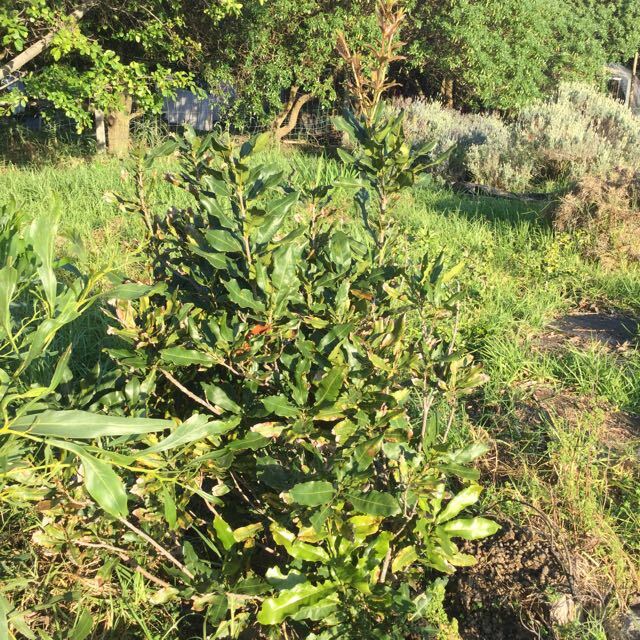 The reservoir will also be fenced off, because my kei apple-Natal plum living fencing was pitiful for actually saving the lives of any non-swimmers. The fencing we're putting in involves 3m posts, set in cement. We already had some cement because the foundation of our house is crumbling because we had such awful builders (in other news, our roof leaks) and Eug spent some time reinforcing the foundation. Anyway, hopefully our fencing will be enough to keep chickens and ducks away from the asparagus, and be one layer of safety between kids and the reservoir. When I was getting quotes for wire mesh for our garden, I got sick of patronizingly being called Lovey, Dearey, or Sweetie by businessmen so I temporarily added my title to my email signature to see what would happen. The result: against all evidence to the contrary, I became a man to the wire suppliers, even after talking on the phone with men, having a double-barreled last name, and presumably sounding like I could maybe not be a man. There are millions of women doctors in South Africa, and yet still we have this problem. This month we decided to get Mozambican tilapia, because there were some fingerlings up for sale just a few blocks away from us, for R5/fish (US$0.32). We bought 20 tiny fish. In our reading about stacking functions to get as many calories as we can from the land, tilapia were always part of the plan. I didn't expect we'd be getting them so soon, and I'm not sure how they'll do or, truth be told, if they're still alive in there. We're not feeding them. We don't have a pump. It's a little cold in Cape Town for this type of tilapia, so we're looking at ways to add a bit of heat. 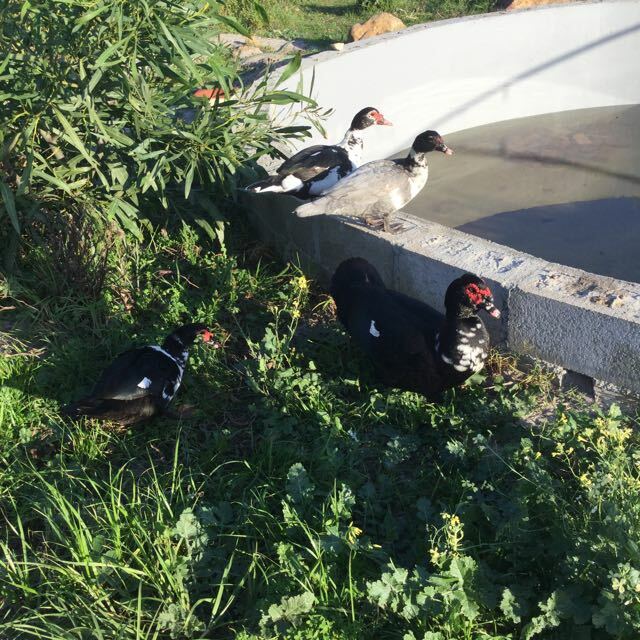 We're adding lots of aquatic plants, and the ducks are pooping in the water (which the tilapia eat, and which also causes algae blooms, which they also like to eat). If we kill all of them, it'll be a R100 ($6.70) learning experience for Eug, me, and the boys, which seems a reasonable risk, as learning experiences go. Chickens and ducks: Before the prospective chicken population growth, the ducks (6) and chickens (6) were eating 1 25kg bag of feed every month, at a cost of R220 (about US$14) for 12 animals. 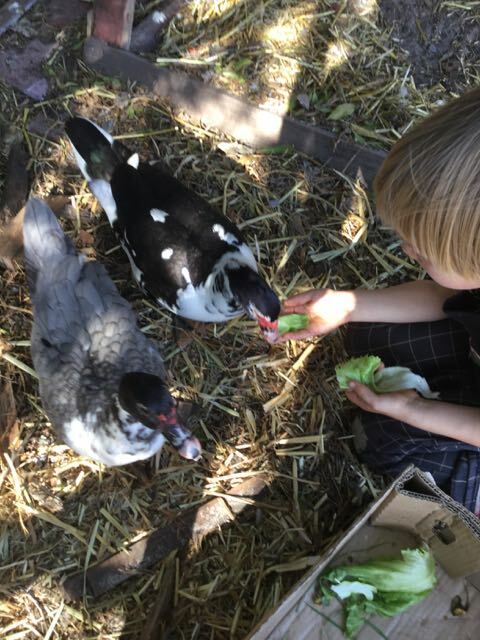 They also get scraps and do a lot of free-ranging (I think ducks probably get 2/3 of their food from foraging, the chickens 1/2). Male is huge from this diet-- at 6 months, he's significantly bigger than Hana (yes, that's our 8month old daughter). I'm starting to reduce our feed costs by buying a huge bag of vegetable scraps from a neighbour who has a farm stall, and starting to sell eggs every month and reduce our feed costs a bit more. As the ducks start to produce eggs and meat, the economics of chicken and duck-keeping begins to shift even more. 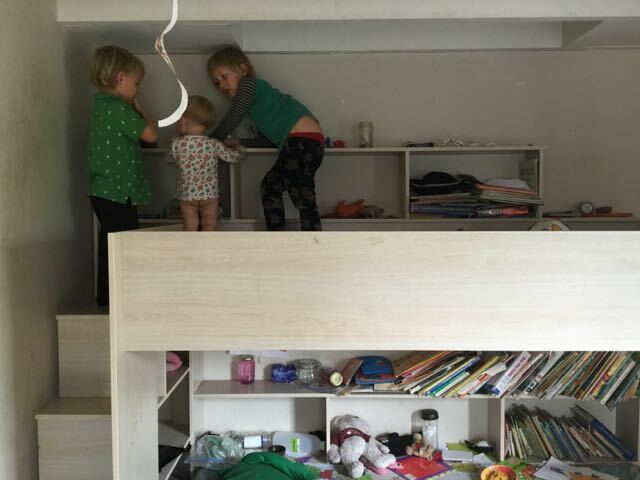 Barring massive theft, we should recoup our startup costs within a year. 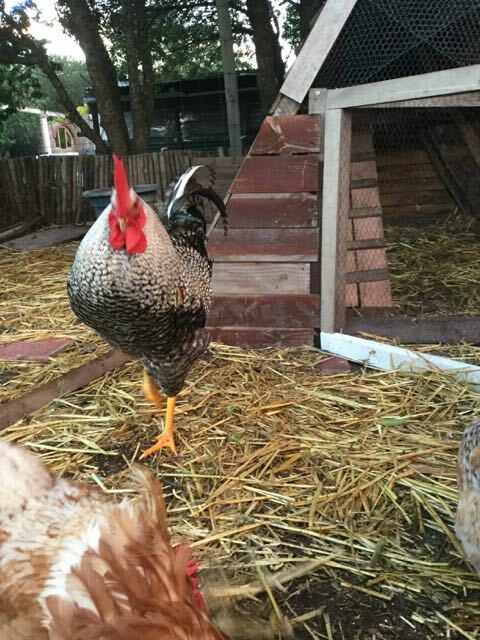 There were a few changes to our chicken population: one of our chickens-- dear Pecky-- got stolen, and the same day someone offered us an unwanted Boschvelder rooster who is adjusting to farm life. Then this week, we were offered four free laying hens by a retiring farmer, and two by a friend living in the suburbs, and some other people asking for us to adopt their roosters. Once those hens are delivered, we'll have 11 hens, and may take one more rooster, so that we have two roosters for the 11 hens. So my take home so far is that keeping free-ranging ducks and chickens does involve some up front costs. 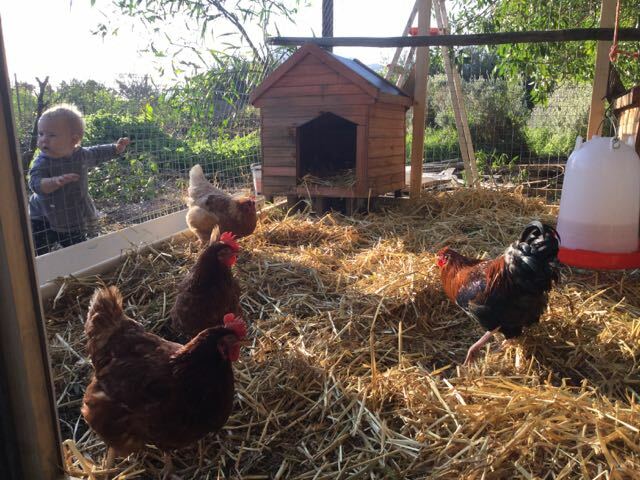 Provided with scraps and forage, they make a lot of economic sense, especially since there is a very large market for truly free-range eggs if you're in an urban or peri-urban setting. Anyway, here's to a wonderful second half of the year. Thank you so much for reading these updates-- sorry they're not more exciting right now.